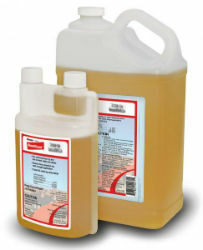 StandGuard is a powerful, low-dose, easy-to-use cattle pour-on. StandGuard Pour-on is an ideal horn fly control solution for your rotational program as it contains gamma-cyhalothrin—the latest generation of pyrethroids—which has not previously been used in beef cattle. It provides season-long control of lice with single application. It is convenient and ready to use—no dilution necessary. The bottles have an easy squeeze-and-pour. One 900 mL bottle treats: 90 head weighing less than 600 lbs. 60 head weighing more than 600 lbs. One 4.5 L bottle treats: 450 head weighing less than 600 lbs. 300 head weighing more than 600 lbs.